The capuchin monkeys (/ˈkæpjʊtʃɪn/ or /ˈkæpjʊʃɪn/) are New World monkeys of the subfamily Cebinae. 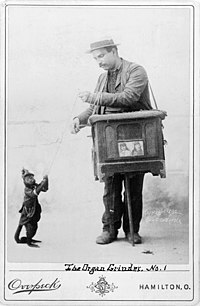 They are readily identified as the "organ grinder" monkey, and have been used in many movies and television shows. The range of capuchin monkeys includes Central America and South America as far south as northern Argentina. In Central America, they usually occupy the wet lowland forests on the Caribbean coast of Costa Rica and Panama and deciduous dry forest on the Pacific coast. White-headed capuchin (Cebus capucinus) on a tree near a river bank in the jungles of Guanacaste, Costa Rica. The word capuchin derives from a group of friars named the Order of Friars Minor Capuchin, an offshoot from the Franciscans, who wear brown robes with large hoods. When Portuguese explorers reached the Americas in the 15th century, they found small monkeys whose coloring resembled these friars, especially when in their robes with hoods down, and named them capuchins. When the scientists described a specimen (thought to be a golden-bellied capuchin) they noted that: "his muzzle of a tanned color,... with the lighter color around his eyes that melts into the white at the front, his cheeks..., give him the looks that involuntarily reminds us of the appearance that historically in our country represents ignorance, laziness, and sensuality." The scientific name of the genus, Cebus comes from the Greek word kêbos, meaning a long-tailed monkey. The species-level taxonomy of this genus remains highly controversial, and alternative treatments than the one listed below have been suggested. In 2011, Jessica Lynch Alfaro et al. 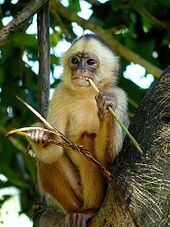 proposed that the robust capuchins (formerly the C. apella group) be placed in a separate genus, Sapajus, from the gracile capuchins (formerly the C. capucinus group) which retain the genus Cebus. Other primatologists, such as Paul Garber, have begun using this classification. According to genetic studies led by Lynch Alfaro in 2011, the gracile and robust capuchins diverged approximately 6.2 million years ago. 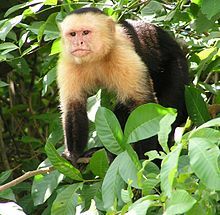 Lynch Alfaro suspects that the divergence was triggered by the creation of the Amazon River, which separated the monkeys in the Amazon north of the Amazon River, which evolved into the gracile capuchins, from those in the Atlantic Forest south of the river, which evolved into the robust capuchins. Gracile capuchins have longer limbs relative to their body size than robust capuchins. Gracile capuchins have rounder skulls, whereas robust capuchins have jaws better adapted for opening hard nuts. Robust capuchins have crests and the males have beards. Females bear young every two years following a 160- to 180-day gestation. The young cling to their mother's chest until they are larger, then they move to her back. 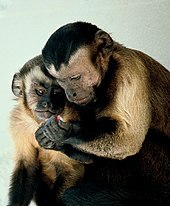 Adult male capuchins rarely take part in caring for the young. Juveniles become fully mature within four years for females and eight years for males. In captivity, individuals have reached an age of 50 years, although natural life expectancy is only 15 to 25 years. 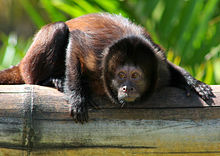 Capuchin monkeys are clever and easy to train. As a result, they are used to help people who are quadriplegics in many developed countries. They have also become popular pets and attractions for street entertainment, and are hunted for meat by local people. Since they have a high reproductive rate and can easily adapt to their living environment, loss of the forest does not negatively impact the capuchin monkey populations as much as other species, although habitat fragmentation is still a threat. Natural predators include jaguars, cougars, jaguarundis, coyotes, tayras, snakes, crocodiles and birds of prey. The main predator of the tufted capuchin is the harpy eagle, which has been seen bringing several capuchins back to its nest. Most animals react to seeing their reflection as if encountering another individual they do not recognize. An experiment with capuchins shows that they react to a reflection as a strange phenomenon, but not as if seeing a strange capuchin. With scenario 1, females appeared anxious and avoided eye-contact, while males made threatening gestures. In scenario 2, there was little reaction by either males or females. When presented with a reflection, females gazed into their own eyes and made friendly gestures, such as lip-smacking and swaying. Males made more eye contact than with strangers or familiar monkeys, but reacted with signs of confusion or distress, such as squealing, curling up on the floor, or trying to escape from the test room. The question of whether capuchin monkeys have a theory of mind—whether they can understand what another creature may know or think—has been neither proven nor disproven conclusively. If confronted with a knower-guesser scenario, where one trainer can be observed to know the location of food and another trainer merely guesses the location of food, capuchin monkeys can learn to rely on the knower. This has, however, been repudiated as conclusive evidence for a theory of mind as the monkeys may have learned to discriminate knower and guesser by other means. Until recently it was believed that non-human great apes did not possess a theory of mind either, although recent research indicates this may not be correct. Human children commonly develop a theory of mind around the ages 3 and 4. Easily recognized as the "organ grinder" or "greyhound jockey" monkeys, capuchins are sometimes kept as exotic pets. Sometimes, they plunder fields and crops and are seen as troublesome by nearby human populations. In some regions, they have become rare due to the destruction of their habitat. They are also used as service animals, sometimes being called "nature's butlers". One organization has been training capuchin monkeys to assist quadriplegics as monkey helpers in a manner similar to mobility assistance dogs. After being socialized in a human home as infants, the monkeys undergo extensive training before being placed with a quadriplegic. Around the house, the monkeys help out by doing tasks including fetching objects, turning lights on and off, and opening drink bottles. Crystal the Monkey is a famous monkey actress. In 2010, the U.S. federal government revised its definition of service animal under the Americans with Disabilities Act (ADA). Non-human primates are no longer recognized as service animals under the ADA. The American Veterinary Medical Association does not support the use of nonhuman primates as assistance animals because of animal welfare concerns, the potential for serious injury to people, and risks that primates may transfer dangerous diseases to humans. ^ a b c d Fragaszy, Dorothy M.; Visalberghi, Elisabetta; Fedigan, Linda M. (21 June 2004). The Complete Capuchin: The Biology of the Genus Cebus. Cambridge University Press. p. 5. ISBN 978-0-521-66768-5. ^ Saint-Hilaire, E. G.; Cuvier, F. G. (1924). Histoire Naturelle des Mammifères. Paris, impr. de C. de Lasteyrie. OCLC 166026273. ^ Rossiter, William (1879). An illustrated dictionary of scientific terms. London & Glasgow: William Collins, Sons, and Company. ISBN 978-0-548-93307-7. ^ Amaral, P. J. S; Finotelo, L. F. M.; De Oliveira, E. H. C; Pissinatti, A.; Nagamachi, C. Y.; Pieczarka, J. C. (2008). "Phylogenetic studies of the genus Cebus (Cebidae-Primates) using chromosome painting and G-banding". BMC Evol. Biol. 8: 169. doi:10.1186/1471-2148-8-169. PMC 2435554. PMID 18534011. ^ Rylands, A. B.; Kierulff, M. C. M.; Mittermeier, R. A. (2005). "Notes on the taxonomy and distributions of the tufted capuchin monkeys (Cebus, Cebidae) of South America" (PDF). Lundiana. 6 (supp): 97–110. ^ a b Silva Jr., J. de S. (2001). Especiação nos macacos-prego e caiararas, gênero Cebus Erxleben, 1777 (Primates, Cebidae). PhD thesis, Rio de Janeiro, Universidade Federal do Rio de Janeiro. ^ a b Lynch Alfaro, J.W. ; et al. (2011). "Explosive Pleistocene range expansion leads to widespread Amazonian sympatry between robust and gracile capuchin monkeys" (PDF). Journal of Biogeography. 39 (2): 272–288. doi:10.1111/j.1365-2699.2011.02609.x. Archived from the original (PDF) on 2015-02-26. ^ a b c Lynch Alfaro, J.W. ; Silva, j.; Rylands, A.B. (2012). "How Different Are Robust and Gracile Capuchin Monkeys? An Argument for the Use of Sapajus and Cebus". American Journal of Primatology. 74 (4): 1–14. doi:10.1002/ajp.22007. PMID 22328205. ^ Garber, P.A. ; Gomes, D.F. & Bicca-Marquez, J.C. (2011). "Experimental Field Study of Problem-Solving Using Tools in Free-Ranging Capuchins (Sapajus nigritus, formerly Cebus nigritus)" (PDF). American Journal of Primatology. 74 (4): 344–58. doi:10.1002/ajp.20957. PMID 21538454. Archived from the original (PDF) on 2012-12-18. ^ Groves, C.P. (2005). Wilson, D.E. ; Reeder, D.M. (eds.). Mammal Species of the World: A Taxonomic and Geographic Reference (3rd ed.). Baltimore: Johns Hopkins University Press. pp. 136–138. ISBN 0-801-88221-4. OCLC 62265494. ^ Mittermeier, Russell A.; Rylands, Anthony B.; Wilson, Don E., eds. (2012). Handbook of the Mammals of the World: Volume 3, Primates. Lynx. pp. 412–413. ISBN 978-8496553897. ^ de Oliveira, M. M.; Langguth, A. (2006). "Rediscovery of Marcgrave's capuchin monkey and designation of a neotype for Simia flavia Schreber, 1774 (Primates, Cebidae)" (PDF). Boletim do Museu Nacional: Nova Série: Zoologia (523): 1–16. Archived from the original (PDF) on 2009-02-05. See also: Mendes Pontes, A. R.; Malta, A. & Asfora, P. H. (2006). "A new species of capuchin monkey, genus Cebus Erxleben (Cebidae, Primates): found at the very brink of extinction in the Pernambuco Endemism Centre" (PDF). Zootaxa (1200): 1–12. ^ a b Izawa, K (1979). "Foods and feeding behaviour of wild black-capped capuchin (Cebus apella)". Primates. 20: 57–76. doi:10.1007/bf02373828. ^ Fragaszy, Dorothy M.; Visalberghi, Elisabetta; Fedigan, Linda M. (21 June 2004). "Behavioral ecology: how do capuchins make a living?". The Complete Capuchin: The Biology of the Genus Cebus. Cambridge University Press. pp. 36–. ISBN 978-0-521-66768-5. ^ Port-Carvalhoa, M.; Ferraria, S. F.; Magalhãesc, C. (2004). "Predation of Crabs by Tufted Capuchins (Cebus apella) in Eastern Amazonia". Folia Primatol. 75 (3): 154–156. doi:10.1159/000078305. PMID 15240980. ^ Ferrari SF, Iwanaga S, Ravetta AL, Freitas FC, Sousa BAR, Souza LL, Costa CG, Coutinho PEG (2003). "Dynamics of primate communities along the Santarém-Cuiabá highway in southern central Brazilian Amazonia". In Marsh LK (ed.). Primates in fragments. New York: Kluwer. pp. 123–144. doi:10.1007/978-1-4757-3770-7_9. ISBN 978-1-4757-3770-7. ^ Van Belle, Sarie; Estrada, Alejandro; Garber, Paul A. (2012). "Collective group movement and leadership in wild black howler monkeys (Alouatta pigra)". Behavioral Ecology and Sociobiology. 67: 31–41. doi:10.1007/s00265-012-1421-5. ^ Janson, C. H. (1984). "Female choice and mating system of the brown capuchin monkey Cebus apella (Primates: Cebidae)". Z. Tierpsychol. 65 (3): 177–200. doi:10.1111/j.1439-0310.1984.tb00098.x. ^ Lynch, J. W. (1998). "Mating behavior in wild tufted capuchins (Cebus apella nigritus) in Brazil's Atlantic forest". Am. J. Phys. Anthropol. 105 (Suppl. 26): 153. doi:10.1002/(SICI)1096-8644(1998)26+<148::AID-AJPA13>3.0.CO;2-U. ^ Sanz, V; Márquez, L (1994). "Conservación del mono capuchino de Margarita (Cebus apella margaritae) en la Isla de Margarita, Venezuela". Neotrop Primates. 2 (2): 5–8. ^ "Black-faced Capuchin". Amazonian Rainforest. Monkey Jungle. Retrieved 2008-10-13. ^ "Saving the monkeys". SPIE Professional. Retrieved 1 January 2016. ^ Boinski, S.; Quatrone, R. P. & Swartz, H. (2008). "Substrate and Tool Use by Brown Capuchins in Suriname: Ecological Contexts and Cognitive Bases". American Anthropologist. 102 (4): 741–761. doi:10.1525/aa.2000.102.4.741. ^ Edwards, Brian J.; Rottman, Benjamin M.; Shankar, Maya; Betzler, Riana; Chituc, Vladimir; Rodriguez, Ricardo; Silva, Liara; Wibecan, Leah; Widness, Jane (2014-02-19). "Do Capuchin Monkeys (Cebus apella) Diagnose Causal Relations in the Absence of a Direct Reward?". PLOS ONE. 9 (2): e88595. Bibcode:2014PLoSO...988595E. doi:10.1371/journal.pone.0088595. ISSN 1932-6203. PMC 3929502. PMID 24586347. ^ a b Chen, M. Keith; Lakshminarayanan, Venkat; Santos, Laurie R. (2006). "How Basic Are Behavioral Biases? Evidence from Capuchin Monkey Trading Behavior" (PDF). Journal of Political Economy. 114 (3): 517–537. CiteSeerX 10.1.1.594.4936. doi:10.1086/503550. ^ Valderrama, X.; et al. (2000). "Seasonal Anointment with Millipedes in a Wild Primate: A Chemical Defense Against Insects?". Journal of Chemical Ecology. 26 (12): 2781–2790. doi:10.1023/A:1026489826714. ^ de Waal, F. B.; Dindo, M.; Freeman, C. A. & Hall, M. J. (2005). "The monkey in the mirror: Hardly a stranger". Proceedings of the National Academy of Sciences. 102 (32): 11140–7. Bibcode:2005PNAS..10211140D. doi:10.1073/pnas.0503935102. PMC 1183568. PMID 16055557. ^ Kuroshima, Hika; Fujita, Kazuo; Fuyuki, Akira; Masuda, Tsuyuka (March 2002). "Understanding of the relationship between seeing and knowing by tufted capuchin monkeys (Cebus apella)". Animal Cognition. 5 (1): 41–48. doi:10.1007/s10071-001-0123-6. ISSN 1435-9448. PMID 11957401. ^ Heyes, C. M. (1998). "Theory Of Mind In Nonhuman Primates". Behavioral and Brain Sciences. 21 (1): 101–14. doi:10.1017/S0140525X98000703. PMID 10097012. ^ Jabr, Ferris (8 June 2010). "Clever critters: Bonobos that share, brainy bugs and social dogs". Scientific American. ^ a b Lineberry, Cate. "Animals in Service". AARP. Archived from the original on 2008-09-16. Retrieved 2008-10-13. ^ "Highlights of the Final Rule to Amend the Department of Justice's Regulation Implementing Title II of the ADA". United States Department of Justice-Civil Rights Division. Retrieved October 2, 2013. ^ "AVMA Animal Welfare Division Director's Testimony on the Captive Primate Safety Act". American Veterinary Medicine Association. Retrieved October 2, 2013. Wikimedia Commons has media related to Cebinae. Wikisource has the text of the 1911 Encyclopædia Britannica article Capuchin Monkey.